There are 8 million migraine sufferers in the UK. Approximately 1 in 5 women and 1 in 15 men will develop migraine at some time in their life, so it's really important that there's a migraine treatment you can trust. Get some useful tips to help prevent a migraine attack. What is a migraine? What causes it and What Can You Do About It? Find your nearest stockist of Migraleve™ products. Want to find out what triggers your migraines? Always read the label. Ask your pharmacist for advice. MIGRALEVE™ contains paracetamol, buclizine and codeine. MIGRALEVE™ Pink contains paracetamol, codeine and buclizine. 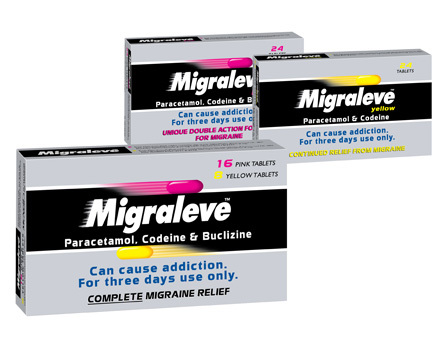 MIGRALEVE™ Yellow contains paracetamol and codeine. Can cause addiction. For three days use only. This medicine can make you feel sleepy. Do not drive while taking this medicine until you know how it makes you feel. This site is published by Johnson & Johnson Limited which is solely responsible for its contents. It is intended for a UK audience. MIGRALEVE™ is a registered trademark. This site is best viewed with the following web browsers: Internet Explorer version 8, Firefox version 2+, Safari 3+, Chrome version 3+.